Let me go straight to the point: if you’ve seen “District 9”, you probably know that Neill Blomkamp is an ambitious Sci-Fi filmmaker. But in case you’re expecting “Elysium” to be as fresh and exceptional as the director’s previous effort, you might be slightly disappointed. 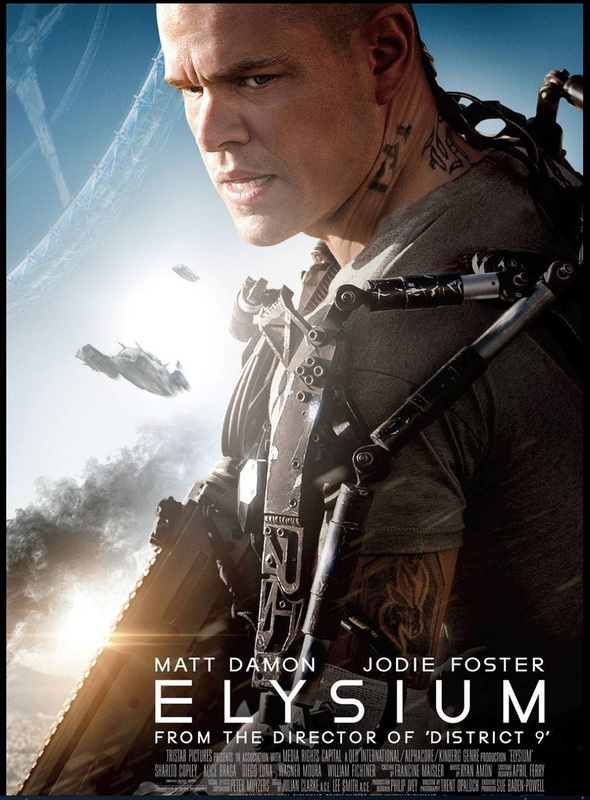 Now don’t get me wrong, “Elysium” is still a major accomplishment. It’s revved up on visionary action, laced with dark humor and powered by a solid idea: in 2154, earth is a dump where the poor live in horrible conditions. Only the privileged few get to live on Elysium, a space station orbiting earth and run with no mercy by Defense Secretary Delacourt (Jodie Foster, in fine form). Matt Damon, in yet another first rate performance, is a factory worker on earth who helps engineer droids. One day he is irradiated in a factory accident and is given 5 days to live. The solution? Get to Elysium and find an instant cure. It’s a hell of a setup and in order for it to work we have to believe in this futuristic world…and we do, even if it’s cold blooded and a bit difficult to cozy up to at first. Blomkamp and his crew, along with Damon and a terrific cast that includes Sharlto Copley, William Fichtner and Alice Braga, rate cheers for grabbing us hard. And even if the results are less than perfect, I still admire what Blomkamp has pulled off, the same way I fell under the spell of his debut feature, “District 9”. He’s a real talent with an unlimited vision. His film works on two levels, providing an entertaining ride but also giving us food for thought, proving that summer movies don’t have to be brainless to be successful. Final verdict: Great, no. Good, hell yes. i left the movie theater arguing with my bf, he said i was cold hearted to not like the ending. i mean i appreciated the efforts of inhabitants of elysium.. the earth even now is overpopulated and in less thn a century if we keep reproducing and using off the resources we will start eradicating ourselves. Elysium people are in some sort the hope to still have humans as a race, surviving after we have used up what the earth has to offer, and having earth people (who made no efforts whatsoever to get there) just TAKEN to the new biosphere that they will use up as well, is just stupid and lame, or so was my opinion. but i liked the movie all in all.